This hard cue tip is a very consistent cue tip with good control. Dynamite laminated cue tip is made out of seven layers of pig leather and treated to a specific hardness naturally. Laminated with VACULAM™ process, Dynamite cue tip is the best priced laminated cue tip for its quality and durability. This tip is the ideal tip for cue makers and manufacturers as the standard tip for their line of break cues. 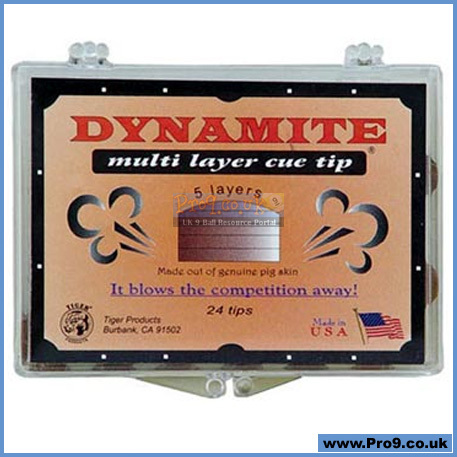 When you play with Dynamite laminated cue tip, IT BLOWS THE COMPETITION AWAY!! All genuine Tiger Dynamite cue tips will have the name, the year it’s made, Tiger logo and Made in USA. If it’s not on the back end of the tip, then It’s not genuine Tiger tip.